The BBQ Table & 2 chair set in White has been so popular that we have sold through the entirety of our available stock for 2018. We will only be making 12 of our BBQ Table 2 seater rectangular table sets for the 2019 season, so time is of the absolute essence. Place your pre-order today, guarantee yourself your table set and pay nothing at all until a week or so before dispatch in 2019. Simply add the set to your basket and choose 'Bank Transfer' at checkout. 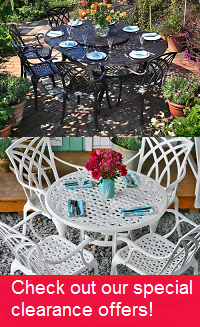 Our BBQ Table table & 2 chair set in White will turn any garden into an idyllic outdoor seating and dining area, perfect for entertaining guests. For a time-worn effect that remains strong throughout the ages, pop on over to the BBQ Table in Antique Bronze. You missed it! Best alternatives for immediate delivery are the Antique Bronze or please call us on 01243 71 71 97 if you would like the BBQ Table in Slate.